I just got my package from Iris in England, and it definately was a pick of England´s finest! 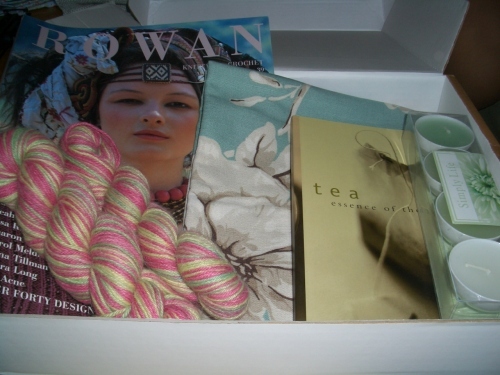 Lovely powder blue fabric with flowers (very British, I think), multicoloured sockyarn in silk/merino, in all of my favourite colours, a copy of Rowan magazine (my first! ), some chocolate, candles (hey, I live in Sweden, we worship candles over here), a book on tea... Everything was so lovely, and so perfect. Thank you so much, Iris, I really enjoyed swapping with you! My sister moved away from home last month, and yesterday I made her a house-warming gift, an absolutely crazy patchwork cushion, loud does not even begin to describe it. I had no idea that I had such a collection of clashing fabrics! But, hopefully, she´ll like it - she doesn´t have your average taste in clothes or anything else, she may appriciate its loudness. I´ll send it to her next month, I´ve so run out of money. I hope my British package has arrived when I get home! 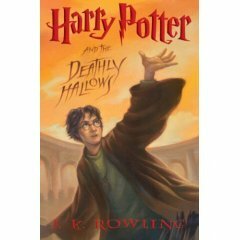 Ok, now it´s released - maybe the most anticipated book of all times - the last Harry Potter book. And I haven´t read it yet. I might have to wait several weeks before I get my hands on it, since I won´t be buying it, but have to wait for it at the library, and there are two persons before me in line. And I can´t wait to see what happens! Argh! mamegoma - cutest seal ever! If you want to shop Mamegoma (ok, - it´s a seal), check out this site, it´s where I found the money bank. I found a tiny baby bird on the sidewalk, on my way out. I put it under a bush, I couldn´t see a nest, I hope it will make it, but I doubt it, unfortunately. I got my swap package from Anneleen in Belgium yesterday, shipped here superfast. There were plenty of nice things - bag, earrings, necklace and more from H&M, a little rosy photoalbum (perfect print! ), teabags, scented sachet, just to name a few. It was a lovely package, thanks a lot Anneleen! I can´t even say finally, because it didn´t take that long at all - my package from Kellie in Kentucky, US, that is. 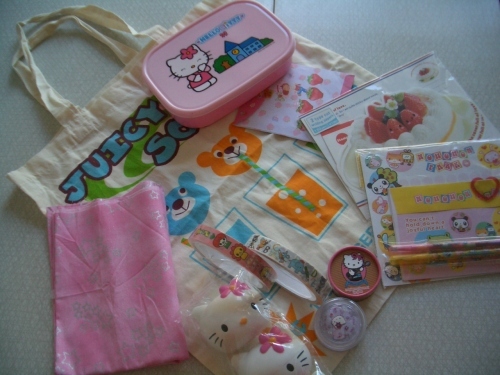 And as last time, it was so wonderful, filled with kawaii goodness: Hello Kitty bento box, Easter treat holders (that is Kitty heads you can put things in), lipgloss and body glitter, Cram Cream deco tape (2 kinds! ), a very cute tote bag, the cutest stationary (2 kinds! ), pink fabric with silver stars for my quilt (soon, I´ll have fabric from all over the world - how great is that?! ), and I think that´s all, but I may have forgotten something - there were so much cuteness! 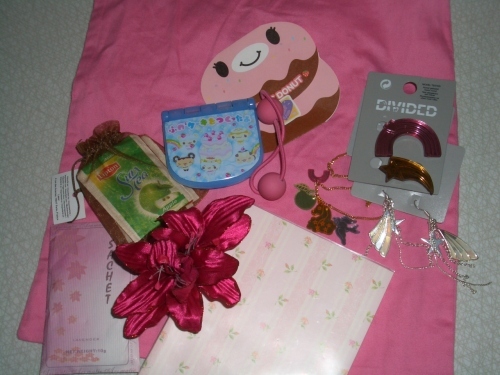 And even the package it came in was wonderful - I may have to save it, all wrapped in deco tape and kawaii stationary. Thank you sooo much, Kellie! It´s always a pleasure! Btw, if you want to se what I sent her, click ME! All my sent packages has been recieved, and according to the recipients, they liked their packages, so that´s all good. I´m still waiting for packages from the US and Belgium, and that elusive package from the Philippines - it´s almost four months now, and I´m pretty sure it´s gone, and I´ll never see it. Too bad! I´ve got another package, to the UK, almost ready, just a thing or two left to add, which means that a package from the UK will arrive sometimes within these next weeks. Yay! An absolutely fabulous childrens movie was made in 1974 (the same year I was born! ), in the little town I grew up in. It´s about Jens, who´s in search of his toys that´s been stolen by the lonely Dunderklumpen. The drawings are wonderful and the music is great, go take a look! Three packages came today! Glass bowl and books from Tradera, and my package from Belle in Canada! Yay! 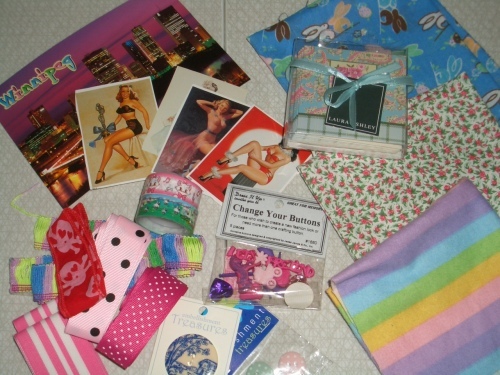 Belle´s package was filled with the prettiest fabric and notions: buttons, ribbons, fabric.... All very pretty, all very lovely, and I´m so happy for it! Thank you so much, Belle! will I get lucky today? What do you think, will I get lucky today? Will I find a nice little pile of packages when I get home? I´ve got some swap packages that should arrive anyday, and I´ve got two Tradera buys coming as well, two books ("Evas Kalender" from the 60s, I love those) and a white bowl in pressed glass. And my copy of SnB 2008 Calendar. Something should have arrived today. I´m sending thre packages today, to Kellie in Kentucky, USA, Anneleen in Belgium and Jo in Shanghai, China (who´s currently in Singapore). I hope they will get them soon, and that they´ll like their packages!